The main parameters of the plant configurations discussed in this paper are listed in Table 1. Pretorius  found that plants with larger chimney diameters provide lower COE. The effect of varying the chimney diameter is investigated using two base configurations with a 1000 m and a 1500 m high chimney. The question of how big a first large-scale solar chimney power plant should be has been asked many times. To reduce the risk for a first prototype, building a smaller plant could be an option. The implications on the design of the PCU of building such a smaller plant are discussed in this paper. The most promising options to improve the plant performance, which are double glazing the collector and applying anti-reflective coating , are also investigated. The multiple horizontal axis turbine configuration using a single rotor layout with IGVs provides the lowest cost of electricity for all plant geometries investigated here. The optimum number of turbines is 10 for the smallest plant and 42 for the biggest plant. The optimal turbine diameter is 31 m for the smallest plant and 41 m for the biggest plant. The lowest COE was found with Configuration 8 (Tab. 1) at 0.105 €/kWh. The COE for the smallest plant is 2.5 times higher due to a much lower annual power output. the optimum increases the COE mainly because the reduction in generator cost is outweighed by the cost for transportation, for the ducts and for assembly and installation (see Figure 2). The counter rotating turbine layouts show similar trends as the single-rotor layout with IGVs. They provide a COE which is only about 1 % higher than the one of the single-rotor layout with IGVs (Figure 3). the collector and chimney cost. The specific initial cost of the PCU resulting from the model presented here ranges from 437 to 1644 €/kW for the various plant geometries. 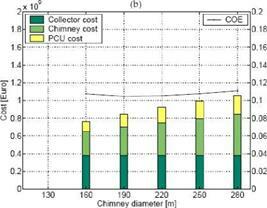 The PCU cost as a percentage of the sum of the collector and chimney cost ranges from 17 to 30 %. On the example of Configuration 5 it is shown that the implementation of double glazing and anti­reflective coating holds a potential to significantly reduce the COE of the solar chimney power plant. With the models chosen in this study the cost of electricity is reduced by 17.8 %. The annual power output increases by 51.7 % while the initial investment cost only increases by 26.0 %. (210 m for the 1000 m high chimney and 280 m for the 1500 m high chimney). 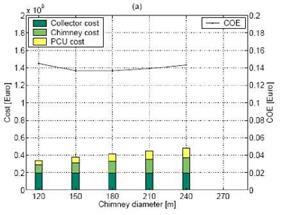 This is because the plant cost model and the cost model for the PCU used here are more sensitive to a change in chimney diameter than the ones of Pretorius (2006) as the collector cost is less dominant. Tab. 2. Results for various chimney diameters for the plant with a 1000m high chimney. Tab. 3. Results for various chimney diameters for the plant with a 1500m high chimney. For a smaller plant (configuration 1) a PCU with 10 horizontal axis turbines provides the lowest cost of electricity (Fig. 5). Even though the overall plant cost for this small plant is only a fraction of the cost of a large plant (e. g. a tenth of the cost of configuration 7) the optimal cost of electricity is 2.5 times higher due to a much lower annual power output. In comparison to configuration 7, for the smaller plant discussed here, the generators, the electrical interface/connection, the power electronics and the ducts contribute a much smaller portion to the PCU cost. In contrast, the inlet guide vanes, the turbine rotors, transportation as well as assembly and installation contribute a much bigger portion. The cost of the chimney for this plant is 21.82M€, the cost of the collector 30.77M€. The initial capital cost of the PCU is between 17.30 and 20.31M€, which is equal to 32.9 to 38.6% of the sum of the cost of the collector and the chimney. This is a much bigger portion than for the larger plants. As a consequence the optimal diffuser area ratio is higher for the smaller plant and the efficiency of the PCU is reduced. For all plants discussed here PCUs with multiple horizontal axis turbine configuration using a single rotor layout with IGVs provides the lowest cost of electricity. For the counter rotating turbine layouts the cost of electricity is only 1.1% higher than with a single rotor layout with IGVs. While the size and performance of the different plants vary a lot, the optimal PCUs all look very similar. The optimal number of turbines varies, but their individual size, the number of blades and even the efficiency of the PCU remain close to constant. The cost of the PCU, however, varies significantly; the specific initial cost of the PCU varies between 437 and 1644€/kW. A large plant with e. g. a 1500 m tall chimney provides a low cost of electricity and a high annual power output. But the financial (and technological) risk is also high. Moving towards smaller plants the risk is reduced. But the annual power output is also reduced, and the cost of electricity increases. Measures like double glazing and anti-reflective coating could counteract this trend. The authors would like to express their gratitude to the VolkswagenStiftung, Germany, and to the National Research Foundation of South Africa for financial support. They would also like to thank Dr. J. P. Pretorius for providing the plant simulation results. Schlaich, J., Schiel, W., Friedrich, K., Schwarz, G.,Wehowsky, P., Meinecke, W. and Kiera, M. (1995). The solar chimney — Transferability of results from the Manzanares solar chimney plant to larger scale — plants. Tech. Rep., Schlaich Bergermann und Partner, Civil Engineers, Stuttgart, Germany. Pretorius, J. P. (2006). Optimization and Control of a Large-scale Solar Chimney Power Plant. Ph. D. thesis, University of Stellenbosch. Pretorius, J. P. and Kroger, D. G., Critical evaluation of solar chimney power plant performance. Solar Energy, 80 (2006) 535-544. Bernardes, M. A.D. S. (2004). Technische, okonomische und okologische Analyse von Aufwindkraft — werken (Technical, Economical and Ecological Analysis of Solar Chimney Power Plants). Ph. D. thesis, Universitat Stuttgart. (in German). Denantes, F. and Bilgen, E., Counter-rotating turbines for solar chimney power plants. Renewable Energy, 31 (2006) 1873-1891. Fluri, T. P. (2008) Turbine Layout for and Optimization of Solar Chimney Power Conversion Units. Ph. D. thesis, University of Stellenbosch. Fluri, T. P. and Von Backstrom, T. W. Performance analysis of the power conversion unit of a solar chimney power plant, Solar Energy Journal, (2008) accepted for publication. Riggs, J. L., Bedworth, D. D. and Randhawa, S. U. (1996). Engineering Economics. 4th edn. McGraw-Hill. Schlaich, J. (1995). The Solar Chimney — Electricity from the Sun. Edition AxelMenges. PV/T technology combines photovoltaic (PV) generation of electric current and thermal (T) conversion of solar energy. 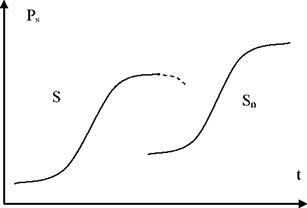 In accordance with the laws of engineering system  evolution of a technical system life can be represented as S-shape curve (Fig.1). 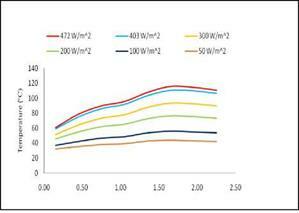 The curve S shows the most important technical parameters Ps (output power, efficiency, cost, life time etc.) depending on time. achieved. A new technical system should appear to achieve better parameters (Sn curve on Fig. 1). In our case, for example, photovoltaic (PV) system after achieving the limiting parameters can be improved only on jumping to a new approach, for instance, using multiplayer solar cells (SC) instead of one p-n junction in SC, or developing combined PV/T systems. Now it is possible to have efficiency already close to 40 % for multiplayer SC if to use only PV conversion. Total efficient of PV/T systems can be even much higher. Sometimes after saturation on the third stage of elaborating a certain degradation of output parameters can be observed (dashed line, Fig.1). One example from solar engineering can illustrate this evolution behaviour of technical production. You can buy multi colored solar cells, but they cost more and deliver a little less energy. However, architects prefer them for aesthetic reasons. Even such decreasing of output parameters is patented. The invention  provides a colored solar cell unit where the application of the color need not be at the expense of the solar cell unit’s output. Fig.1. Evolution of a technical system. The main advantage of PV/T hybrid systems is their high total efficiency. A logic of developing new solar systems demands both types of solar conversion. That is why more and more publications are devoted to combined PV/thermal systems last years (see, for example, following references from [3, 4]). Co-generation of heat and electricity is a good factor for integrating solar energy systems into buildings. Our analysis shows a general tendency of integrating of different solar energy technology. Chart at Fig.2 reflects this tendency of integrating classical solar energy technologies with modern ones . The model for generation of load profiles has been described and validated in  and . It constructs household electricity load profiles for a number of end uses by adding appliance loads together, according to use patterns described by time-use data in a representative sample of Swedish households. In this respect it can be classified as a bottom-up model, similar to that in . The model is dependent on (a) time-use data, (b) data on mean appliance powers and (in some cases) maximum appliance runtimes and (c), for modeling of lighting, data on daylight availability. The time-use data set used, collected by Statistics Sweden, has undergone thorough examination and has been used previously in activity visualization studies (see for example ). Representative appliance characteristics were collected from publicly available product tests from the Swedish Consumer Agency  and daylight availability data were generated for a standard building in Stockholm with Satel-Light . The resulting load data consists of annual series of aggregated hourly electricity demand for 11 different end-uses in the almost 200 households in the time-use data set, corrected for seasonal variations and validated for consistency against preliminary results from ongoing large-scale measurements performed by the Swedish Energy Agency . The magnitude of the natural convection heat transfer is related to the mass flow rate of the air, which is established by the dynamic balance of two opposing effects: buoyancy and friction. Inherent to the flow inside the duct, are the pressure difference between the inlet and outlet air of the channel since the mean air temperature along the axial length of the duct in the flow direction will change (constant heat flux). It would be expected that the presence of these structural element will increase both the heat transfer rate and the hydraulic pressure loss. Under natural convection, the pressure drop due to the buoyancy forces is a result of the temperature difference between the heated surface and the column of the air in the duct. At a typical height (x) from the base corresponding to length (Lx) of the duct, the buoyancy pressure drop is given by . The steady state values were recorded over a period of time. Due to measurement fluctuations in the experiment a statistical uncertainty analysis was conducted. Initial analysis of the raw data yielded the mean and standard deviation of the measurements. Assuming the measurement fit a normal Gaussian distribution, the uncertainty was then calculated with a confidence level of 95%. The error propagation method was used and the average data evaluated. Figure 6 gives the magnitude of friction losses. It can be seen from figure7, that at a specific heat flux, buoyancy forces can be neglected. Figure 8 shows a typical temperature profile of components at steady state at a constant heat flux of 350W/m2, while illustrates the variation of the local air velocity as function of various heat fluxes. As illustrated in figure 8, the air temperature under the wood strips Ta2, Ta4, and Ta6 (figure 2) remained lower than the air temperature in the cavities (Ta1, Ta3, Ta5, Ta7). At steady state the air in the cavities and the bottom plate have the same temperature. As expected, the presence of the structural elements in the channel constituted an obstacle to the air flow inside the channel due to the increase in pressure drop and friction losses. Consequently, under the same constant heat flux, the reduced air flow rate in the channel due to the wood strips led to an increase in the components temperature as compared to the system without wood strips as illustrated in figure 9. Experimental investigation of temperature distribution in a BIPV system under natural convection has been done. The results of the experiment show that the framing structure of BIPV under natural convection does not contribute to the temperature reduction of photovoltaic module cells. The temperature at the boundaries and the velocity profiles are used to create and validate CFD numerical models . The current ongoing research work is supported by the Solar Building Research Network, a NSERC Strategic Research Network. A special thank to the Solar Calorimetry Laboratory at Queen’s University (Ontario) and the Department of Building, Civil, and Environmental Engineering at Concordia University (Quebec) for hosting the research work. at the bottom plate side (Wm"2K-1). Heat flux at the bottom plate (W/m2). Liao, L., Athienitis, A. K., Candanedo, L., Park, K-W., Poisant, Y., and Collins, M. 2007: Numerical and Experimental Study of Heat Transfer in a BIPV-Thermal System. ASME Journal of Solar Energy Engineering, Volume 129, Issue 4, pp. 423-430. Brinkworth, B. J., Sandberg, M., 2005. A validated procedure for determining the buoyancy — induced flow in ducts. Building Services Eng. Res. Technol. 26, 35-48. Brinkworth B. J., 2000. Estimation of Flow and Heat Transfer for the Design of PV Cooling Ducts. Solar Energy 69 (5). Moran M. J, Shapiro H,.N., 2002. Fundamentals of Engineering Thermodynamics. 5th edition, Wiley John Wiley & Sons, Inc.
 Kreith F., 1997. The CRC Hand book of Mechanical Engineering, Chapters: 2-4 and 9, CRC Press London. Tsuji T., Nagano Y. 1988. Characteristics of a turbulent natural convection boundary layer along a vertical flat plate. International Journal of Heat and Mass Transfer 31, 1723-1734. Smolec, W., Thomas, A., 1994. Problems encountered in heat transfer studies of Trombe wall. Energy Conversion and Management 35, 483-491. Candanedo L, Diarra C, Athinietis A, and Harrison S. 2008: Numerical modelling of heat and fluid flow in an asymmetri-cally heated tilted channel, 3 Canadian Solar Building Conference. Fredericton-New. Canada decided to investigate air as the transfer medium to remove heat from PV arrays, represented by Conserval’s SolarWall transpired solar collector, while most of the European members focused on liquid heat removal. Rather than develop a new PV thermal panel, Conserval took the approach of combining commercially available PV modules on top of the transpired collector and utilizing the unique air balancing features of the transpired collector to remove heat from the back of the PV array. In essence, the PV panel becomes a back pass solar air collector with the PV cells acting as the solar heat absorber with ambient air passing around and behind each PV module, removing heat and then the heated air enters the perforations in the transpired panel. This concept allows for heat removal from most PV modules currently available on the market and avoids the lengthy delays associated with developing a new PV panel and obtaining the associated electrical approvals. The trend in PV installations has been to use larger PV modules. To obtain data that is representative of the PV systems currently being installed, popular models from three manufacturers were chosen. It is realized that the thermal performance may not be optimized but the objective was to determine the amount of heat that could be recovered from these readily available modules. Two test labs participated in the PV thermal air tests, Canada’s National Solar Test Facility (NSTF) located in Mississauga Ontario and the Danish Technological Institute (DTI) located in Taastrup Denmark.